Because I’d like to think we humans are reasonably intelligent, we’re having an increasingly difficult time turning a blind eye to the amount of waste we produce just by living our daily lives. 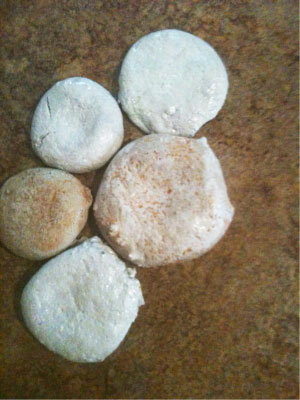 Our disposal of paint, in particular, is falling under more and more scrutiny. 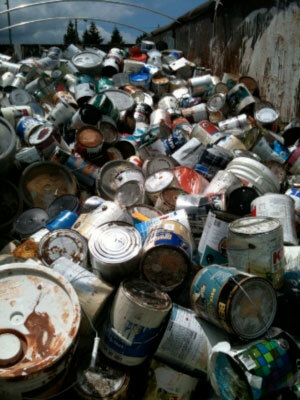 ePaint Recycling founder Jim Cosby is looking for any possible use for leftover paint. It is estimated that the amount of paint discarded in North America each year is almost five times the amount of oil that the Exxon Valdez spilled into Prince William Sound in 1989. That incident has long been considered a benchmark of environmental disasters, but paint disposal is ongoing and much larger. The Paint Exchange in Massachusetts is the brainchild of three women whose goal was to save the world, but they settled for keeping paint out of landfills. The women manufacture reColor brand latex paint from surplus interior latex brought to their shop. The line boasts a broad range of colors, premium quality, various sizes, and a price that’s about half that of new paint. The Paint Exchange manufactures reColor brand latex paint from surplus interior latex brought into the shop. Not-for-profit organization PaintCare, created by the American Coatings Association, passed the first paint product stewardship law in Oregon, followed by California and Connecticut. Rhode Island just approved a PaintCare law this summer and is now working to implement it. Where there is a need, there is money to be made. And the challenge we find ourselves facing has given birth to many a new business—specializing in both the recycling of old paint and the production of new paint made from recycled material. Earth911.com is a privately owned company that maintains a comprehensive, geographically based directory of recycling locations for more than 300 materials, including various types of paint. The website also offers recycling news and information. On a larger scale, Amazon Paints operates two facilities, one in California and one in Minnesota, and manufactures eco-friendly latex paints. Their Amazon Select brand has made the approved products list at MPI (Master Painters Institute) and earned a Green Seal stamp of approval. The company says Amazon Select “meets or exceeds the performance specifications of national paint brands”; can be used for interior and exterior application; is suitable for drywall, wood, stucco and masonry; and is available in 12 colors and a flat finish, with custom colors and sheens available for large orders. Amazon’s website says its Amazon Select paint contains over 80% post-consumer content material and therefore qualifies for LEED credit, with additional credits available if your project is within 500 miles of either of Amazon’s paint recycling facilities. In the UK, Newlife Paints has been producing water-based paint from a minimum of 50% recycled content for about 10 years and has won awards for its efforts, including one from the British Coatings Federation. 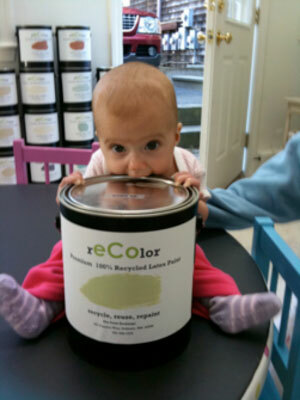 Newlife Paints is packaging its paint in buckets made by RPC Containers and comprised of 25% recycled material. See the Durability + Design news article for more information on RPC Containers. ePaint Recycling is a company in Michigan founded by Jim Cosby, a veteran paint industry worker who’s been in paint sales and marketing, as well as a contractor. ePaint Recycling processes unused paint and manufactures its own line under the brand name Everybody’s Paint. The company maintains that the quality of Everybody’s Paint rivals $30 national brands at its much lower price point of $10 a gallon. ePaint Recycling produces these faux stones for decorative indoor use made from frozen and/or soured paint not suitable for recycling. Cosby is very interested, however, in the paint recycling industry as a whole, and is developing tools for paint recycling, as well as non-paint applications for products made from recycled paint mixed with other recycled materials. He’s constantly looking for alternative uses for every byproduct of his process with special attention to that which is deemed unusable. 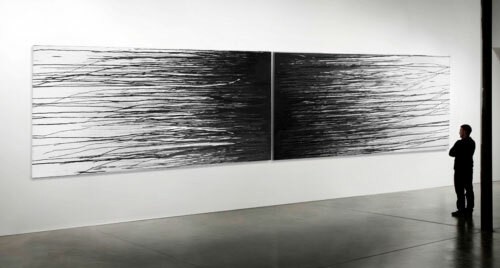 Residual paint from spray cans is pressurized and forced onto canvas. Experimenting with different parts of the spray can. 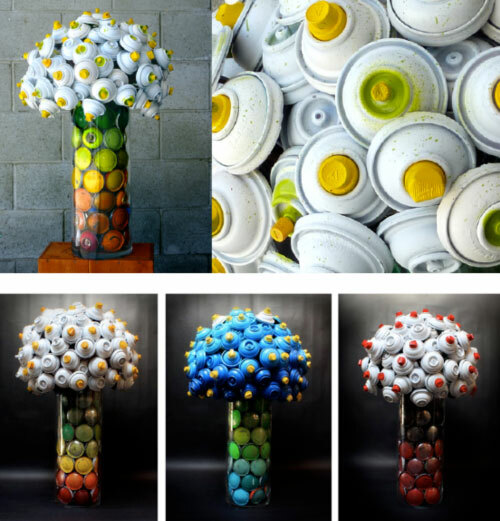 Hillary Coe is an artist affiliated with a project called Can Love, a graffiti recycling program whose mission is to “collect discarded spray paint cans and turn them into works of art.” Coe, who refers to herself as “a creator” and possesses an impressive portfolio of commercial work, creates works of art from abandoned and discarded spray paint cans. 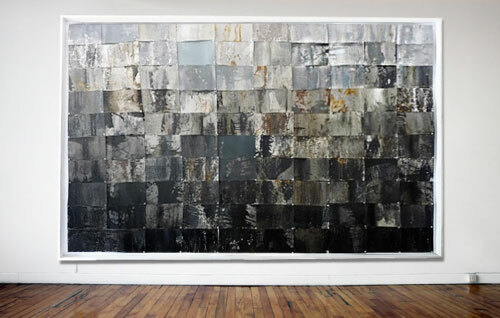 This piece is made from 100 riveted cans of spray paint turned inside out. The green revolution is manifesting a shift in the way we live and do business, because no one can deny the importance of acknowledging and working to reverse any negative impact on our environment. That’s a given. But working diligently alongside any movement in the history of humanity are the artists: documenting, reflecting and stopping to smell the roses—or in this case, the aerosol paint cans.